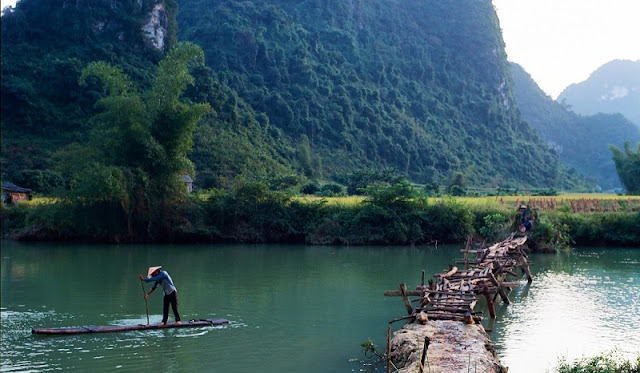 Just a few hours north of Hanoi, the beautiful province of Cao Bang awaits. Hardly known by foreign tourists, Vietnam’s northern-most region is one of tremendous natural beauty. The deep valleys, green hills and pointy limestone karsts make the landscape one you’re likely to remember long after you’ve returned home from your trip to Vietnam. As with all places, of course the season during which you visit will have a great impact on how your trip goes. Generally, you can travel to Cao Bang any time but knowing what to expect during the various seasons will help you pack and plan your trip to be sure you make the most of visiting one of Vietnam’s most beautiful provinces. Spring is a wonderful time to visit Cao Bang. With temperatures reaching the mid to high 20s during the day you’ll be able to enjoy exploring the outdoors without getting too hot. Nights can get a bit chilly with temperatures hitting the low 20s. If you get cold easily, bring a warm sweater to sleep in. Since there is little chance of rain during this time, you’ll largely be out on dry, safe trails enjoying the region’s beautiful landscape. Springtime is also when many plants come back to life after winter, so you’ll see meadows and forests dotted with the light green of spring. Cao Bang’s first rice season starts in February, so you’ll likely see farmers out planting rice early in the month. 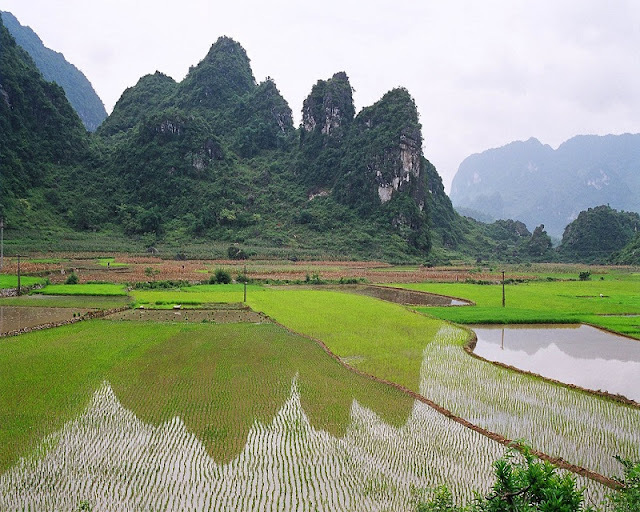 In March, the paddies will be a rich, lush green, giving you a real-life experience of all those photos and postcards that probably inspired you to visit Cao Bang. From April, things quickly start to heat up in Cao Bang and temperatures reach the high 20s to mid 30s during the day. The heat paired with the humidity can be quite strenuous on the body if you’re not used to it. Always have enough water with you, try not to overexert yourself and take breaks when you’re tired. Maybe have a nap in one of the famous hammock cafes during the hottest time of day and keep exploring in the afternoon? A great way to explore Cao Bang during the hot months is on a motorbike. The wind will help you keep somewhat cool and the views from the bike are amazing. Just picture the golden rice paddies ready for harvest in May and June… Make sure to use a lot of sunscreen or cover up well as hands and legs burn easily while you’re riding your bike. Towards the end of summer as it starts cooling down a little, Cao Bang’s rainy season starts. This means heavy downpours on an almost daily basis. The good thing is that often the rain only lasts for an hour or two, so you can head back out when the clouds move on. Hiking trails will likely be muddy and slippery though, so keep that in mind when you’re planning your trip. 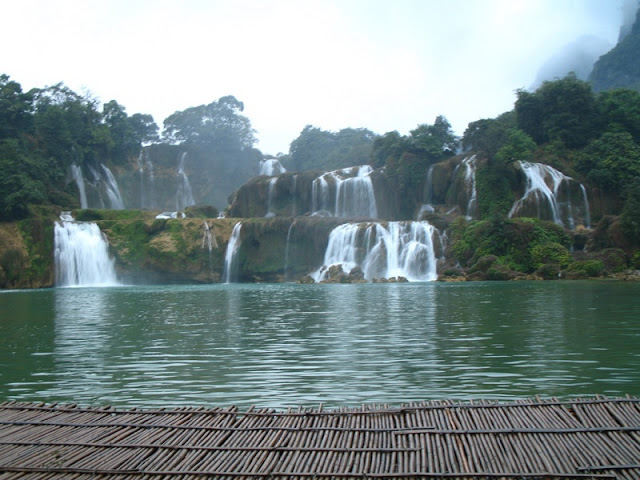 If you’re in Cao Bang during the rainy season, you must visit the famous Ban Gioc waterfalls. At this time of year, they have the most water and are even more spectacular than the rest of the year. Apart from that, the second rice season starts in July, so you’ll get another chance to witness the planting and irrigation of the paddies. Autumn in Cao Bang is when temperatures really start coming down and daily rains make the landscape even lusher and greener (if that’s even possible!). At this time of year, expect temperatures in the mid to high 20s. On cool days you might need a light jacket and a warm sweater for nighttime. While all the rain might make trekking difficult due to muddy trails, it’s still worth it to explore Cao Bang in autumn as fields and forest will be teeming with wildflowers, even more than during spring. It’s not for nothing that October and November are known as the wildflower season of Cao Bang. If you’re not afraid of the cold, a winter trip to Cao Bang could be something for you. By now the rains have largely stopped so trekking will be easier, safer and maybe even less strenuous than in summer and autumn. Similar to Sapa, some of Cao Bang’s more mountainous regions get snow every once in a while, so make sure you come prepared! If you’re planning a motorbike tour during this time, bring a warm jacket, gloves and a scarf with you. Otherwise you risk feeling extremely cold on your bike and you might not be able to enjoy the ride as much. Come nighttime, you need to be ready for the cold. Temperatures can get close to freezing so a cozy hoody, fluffy pyjama pants and warm socks will be necessary to keep you warm while you sleep.